Are you tired of substandard offers and bland networks that just ain't choice? Get the real blue stuff. Here at LosPollos, the finest offers are brought together with love and care, then slow cooked and optimized to perfection. Yes, the old ways are still best at Los Pollos Hermanos. But don't take our word for it. One test, and you'll know. With El Traficante, our unique traffic optimization system, each visitor is analyzed by a host of criteria, and then redirected to the best matching offer. Leave the hard work to us and focus on what you love doing. El Traficante will manage your traffic and automatically increase conversion rates. Start making money with our global smart link today! If you're looking for a solid network to send your traffic to, just sign up. Registration is a no-brainer and takes only a few seconds. LosPollos.com - Global dating smartlink. One test, and you'll know. Hola Gustavoo, why CPA Network? Your blue meth was great. Also, we have started testing our new geo rotator in a private mode: Mainstream, this is a great opportunity to increase monetization of your non-adult traffic. In order to get access to a new rotator, please contact our support team. Breaking Good News from Gus: Now, El Traficante also offers a Mainstream smartlink, in addition to our existing top-performing Dating and BizOpp smartlinks. The best way to use it is with pop-unders on entertainment or other similar sites. For better search engine traffic results we recommend using Coupons, Freebies and Deals-related keywords. Feel free to contact our affiliate support for more details. Get your new Mainstream smartlink now and start promoting! Hey LosPollos.... What are you using to power the network? I'm curious. We use our own solution. The Los Pollos team is coming to Affiliate World Europe! From June 14th - 15th we will be in Berlin, and we can?t wait to meet and chat with some of our existing and future partners. You can easily book a meeting with Los Pollos by filling out this form: docs.google.com/forms/d/1XuJ9fbfN8AYi-ZaFX5P4Y0pfIW5y3ccFEOrrLXx9giY, or by sending us an email at [email protected]. Let us know a convenient time for you to meet, and we?ll see you in Berlin! Good news! 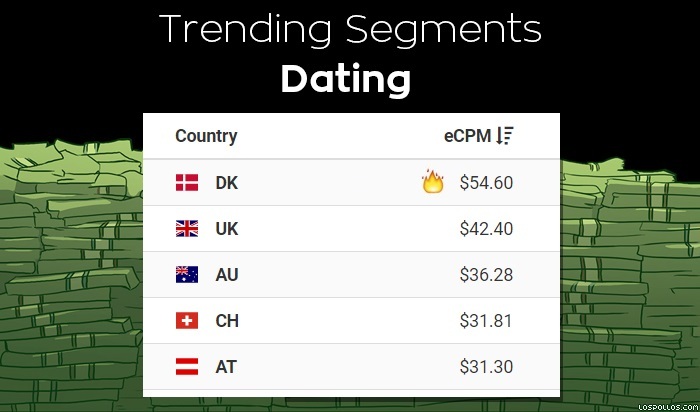 Now you can view our daily TOP eCPM by country in the "opportunities" section of your account! Maximize monetization of your traffic with the Los Pollos Mainstream smartlink! How do I send traffic to the Mainstream vertical? This smartlink is a great opportunity to improve the monetization of your non-thematic traffic. Our algorithm selects the best solutions amongst our sweeps, 1-click / pin submit and entertainment offers. This solution works especially well with pop up and pop under traffic. Step 1: Copy the code for your pop-under from the ?Offers? section of the Los Pollos dashboard. Step 3: Add the code to your site! And voila! You?re achieving an additional profit. This process works great as supplementary monetization for your existing sites. If you?re a media-buyer holding paid traffic that has been rejected by other providers or GEOs, this is a great solution for you. We accept and convert any kind of traffic - remnant, geo-redirect, or exit. For our preferred partners who can send big volume, we are ready to discuss favourable individual conditions to suit your goals. We really need to talk! We will be attending the European Summit from the 14-17th of September in Prague. We're looking forward to meeting our current and future partners, and of course we'll happily meet anybody who wishes to learn more about the capabilities and potential of our platform. 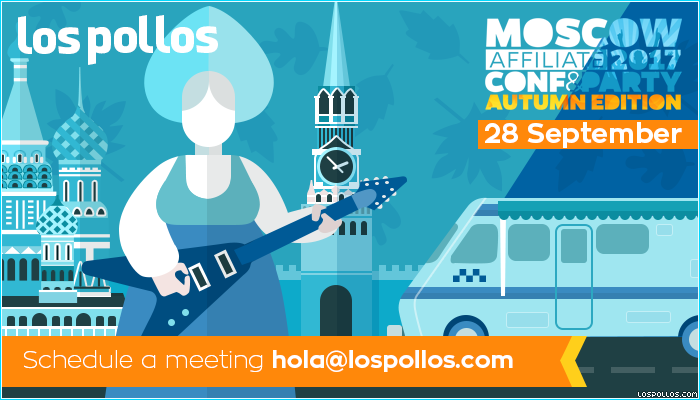 We are pleased to announce that the Los Pollos team will attend the Moscow Affiliate Conference, which will be held on September 28 in Moscow. We?re looking forward to meet our existing partners in person, and happy to make new connections with you all. Get in touch with us at [email protected] to arrange a meeting with our team. Tired of fishing for conversions in other verticals? Dating is always here for you. Check out our top eCPM! Hey guys! Take a look at the hottest trending geos for our dating smartlink this week! Los Pollos here with an unheard of Black Friday deal for you: 1. Send your traffic to our Mainstream Smartlink 2. Get Paid! Unbelievable! Scandinavia always performs, but who would have guessed IPhone X is so popular in Middle Earth? New Zealand is 2nd this week in our Mainstream Top 20! Whether you?re already using it, or about to implement our Mainstream smartlink, our algorithm is indicating that Japan is trending for sweeps, pin submits and entertainment offers. We recommend you pay special attention to the land of the rising sun this week. Our Russian Dating eCPMs are so high this week, you?d think they?d been doping! Don?t worry, we swear they?re 100% clean. Our Mainstream eCPMs are magically delicious this week! Chase the rainbow to our pot of gold in Ireland. Carnival may be over but the party keeps bumping in Brazil with our Braziliantly high Dating eCPMs! SPARTANS! What is your profession?? Duh, it?s internet marketing. Prepare for glory with Los Pollos! Our most trusted and respected partners have been quietly testing our newest Gambling Smartlink over the past weeks. Now we?re ready to open this smartlink up to you. If you have thematic traffic, roll the dice on our global smartlink - you won?t be disappointed!